Hi everyone! Hels here! 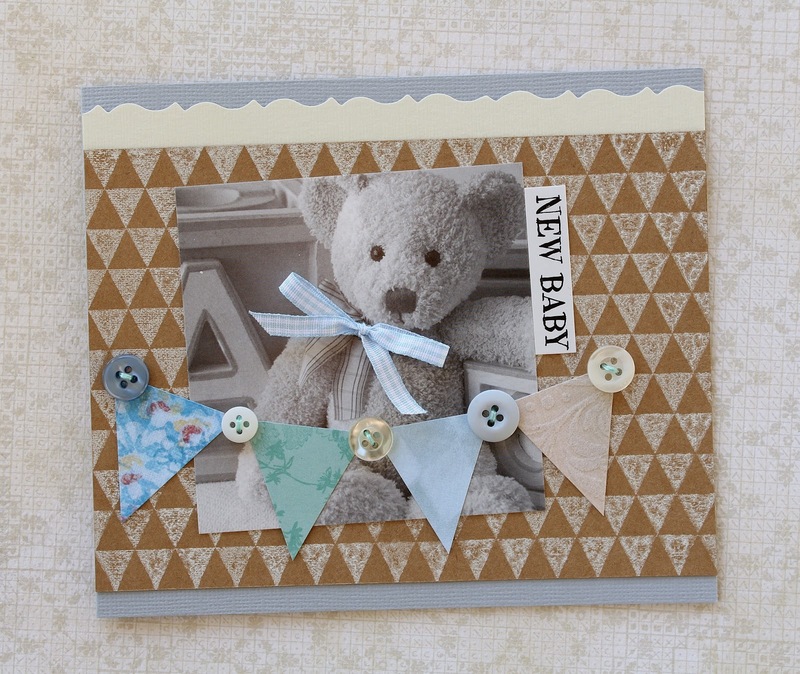 I have been playing with the fabby new background stamp called Gazette. It is a big stamp, which means that it makes a versatile addition to your collection... use it, as I have, in its entirety... or cut out the adverts and use them individually... colour the adverts, ink them up in different colours... the ideas are limitless! My creation started out as an offcut of mountboard that was cut to the same size as the background stamp - which is approx 4 1/4" by 6"... told you, it is a cracking size. You can also see the detail in the this stamp too... a close up of my creation will help you see the teensy text is perfect! I covered the mountboard with a coat of Distress Paints in Antique Linen, Bundled Sage and Broken China and then once this was dry, stamped my image onto cosmetic tissue, cut it to size and then used Glue & Seal to collage the tissue to the mountboard base. Once this had dried off, I used a smidge of Antique Linen DP on my finger to blend over the top of the tissue stamping to tone it into the background. Next, I painted the outer edges of a 5 x 7 canvas board with Black Soot DP and popped a piece of organza ribbon onto the mountboard piece... glued the two together and then added eyelets and some rusty wire for a hanging. The decorations are paper flowers, the words are from the Art De Fleur Word Strip and three ickle butterflies from the Wings set which were coloured with Distress Marker. A few pearls as finishing touches and voila, one vintage hanging! That's all from me for today... thanks for looking! Here in the states, summer is just days away, but it feels like summer right now after using the Sunshine Background stamp. 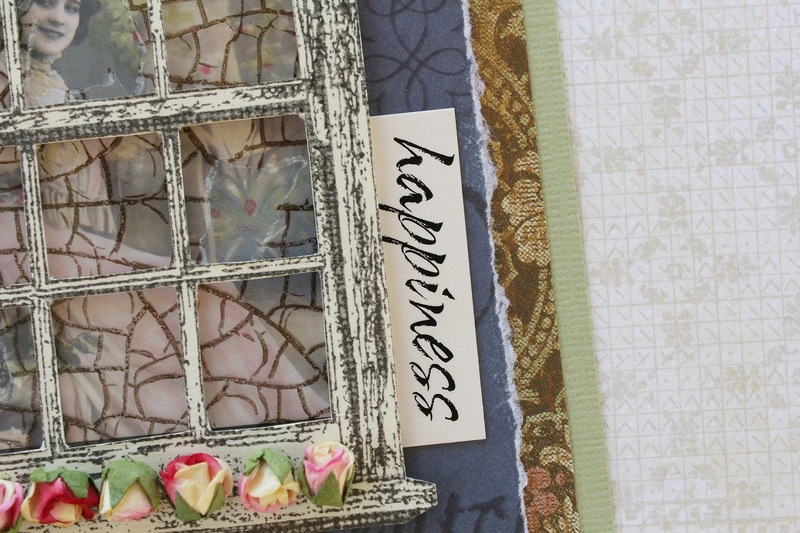 I wanted to fill in the empty spaces between each sunbeam by letting a few images peek through such as the French Script Background and images from the Butterflies stamp set. I began by stamping a block of cardstock in orange using the French Script Background and randomly stamping butterflies in coordinating colors. I then stamped the Sunshine Background stamp using watermark ink and then embossed it using pink embossing powder. The center point from which all of the sunbeams flow is highlighted by using scallop and circle punches and an image from the Bright Blossoms Photochip sheet with a sentiment from the Bright Blossoms Wordstrip. This is one of those stamps that just leaves you with a smile on your face! Hello stampers! 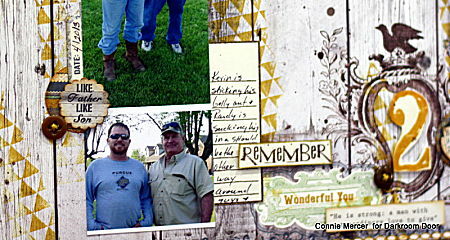 We'd like to share some projects using the Brick Wall Background Stamp! Details from Teresa: Isn't it the perfect grungey background for a boy themed card? For this background, I chose some patterned paper and then covered it in a thin layer of gesso. While it was wet, I stamped the Brick Wall Background into it and left it to dry. 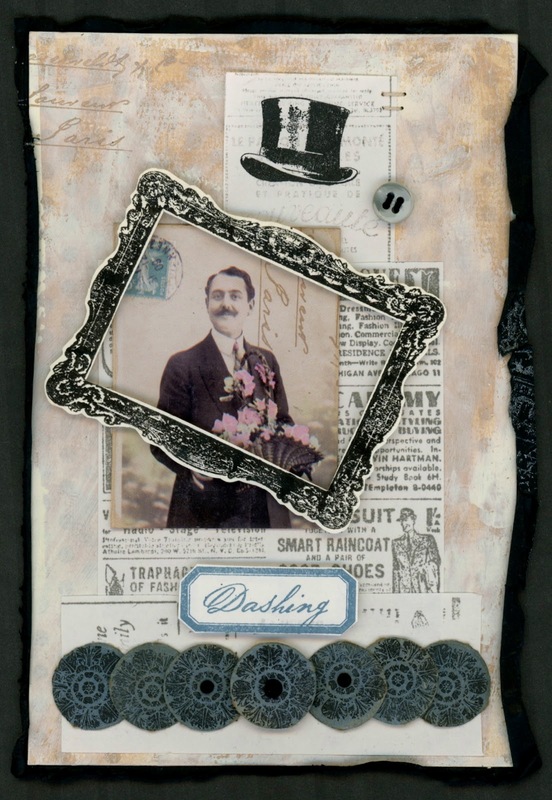 Then I sponged some Vintage Photo Distress Ink on the edges, and stamped the word 'Skater' with Coffee Archival ink. To complete the card, the skater image was stamped with Coffee Archival ink onto kraft cardstock, then fussy cut. I also made a second generation impression of the words 'Born to SK8' int he top right hand corner to look like faded graffiti. So today I have two Christmas cards to share with you. I applied the Brick Wall stamp to cardstock with Ranger Archival Ink in Jet Black. I then applied Distress Inks in Fired Brick and Aged Mahogany. For the 'Ho Ho Ho' card I flicked water over it with my fingertips to create a rain soaked look. I stamped the Window Frame Stamp on cardstock, inked it and then cut to size to frame the Dear Santa Photochip on the inside of the card. 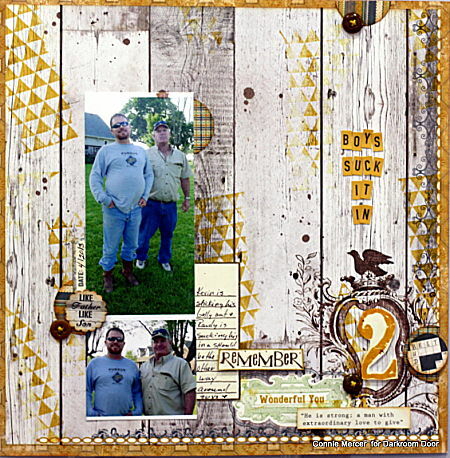 I also have another project to share with you using the Brick Wall Background Stamp. I had an idea to create a little house using the Brick Wall Background Stamp for the walls and the Corrugated Iron Background Stamp for the roof. Then I remembered I had a Dusty Attic birdhouse in my stash. PERFECT!! I applied the Brick Wall and Corrugated Iron stamps to the smooth side of white cardstock to create the panels for the walls and roof. I also used the Flower Garden Background Stamp for the floor. I used the crayon resist technique on the roof and floor and inked with Distress Inks in Pumice Stone, Weathered Wood, Stormy Sky and Faded Jeans. I also cut out some extra bricks from the scraps and added to the house with 3D foam for extra dimension. The small "Welcome Home" sign was created using the Wooden Frame Stamp and a quote from the Home Sweet Home Rubber Stamp Set. Some butterflies from the Butterflies Rubber Stamp Set were the perfect touch to complete my birdhouse. Thanks so much for stopping by and checking out our projects today! Hi everyone! 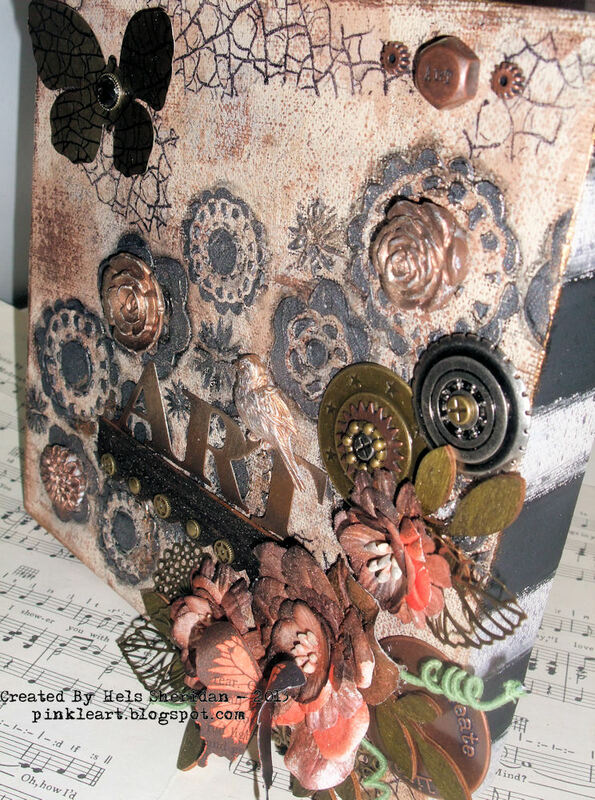 We're so excited to be joining the Sizzix UK blog each fortnight to share ideas on how Sizzix dies and embossing folders can be combined with Darkroom Door rubber stamps and paper products! I've been using Sizzix dies for over 10 years now and continue to love them! So I'm looking forward to sharing ideas with you using the both of them together! 1. 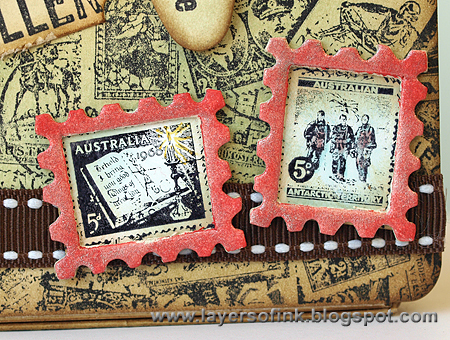 Stamp 'Splatter Background DDBS009' onto folded blue card using Archival Sepia ink pad. Sponge around the edges of the card using the Sepia ink pad with an ink blending tool. 2. Cut the Styled Label from grungeboard. Stamp the quote from 'Artist DDRS027' stamp set onto the label using Archival Jet Black ink pad. Sponge around the edges of the grungeboard using Walnut Stain Distress Ink. 3. Pierce a hole at the top and bottom of the label using an awl and insert two decorative brads. 4. Adhere grungeboard to front of card using foam adhesive to complete! 1. 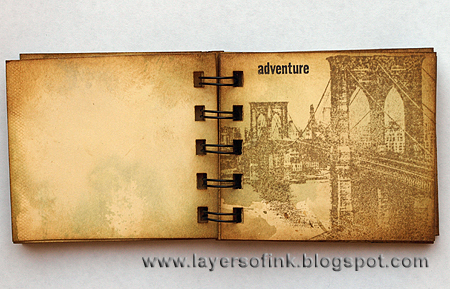 Stamp 'Mesh Background DDBS016' onto folded cream card using Archival Sepia ink pad. Lightly sponge around the edges of the card using the same ink with an ink blending tool. 2. 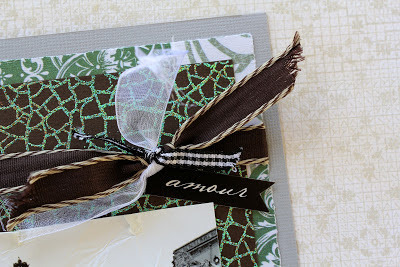 Tear a strip of kraft glassine paper and sew onto the bottom of the card using a zig zag stitch on your sewing machine. Crumple up the edges of the paper to give it more texture. 3. 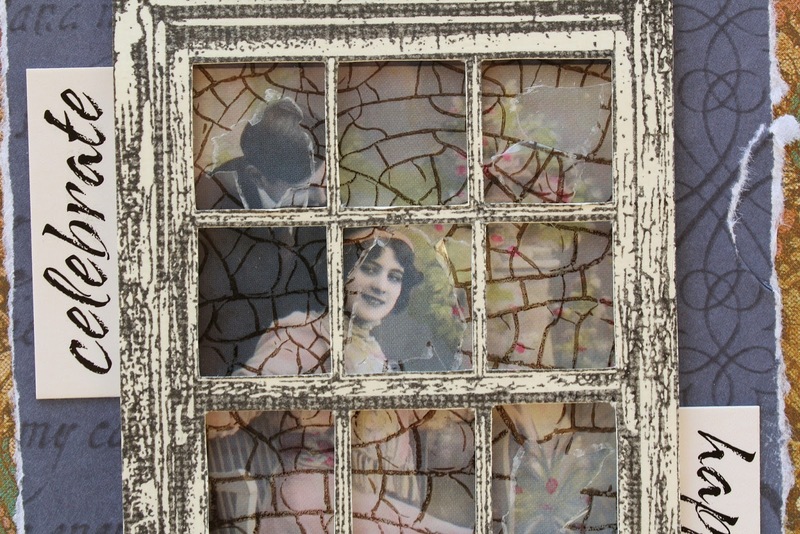 Trim an image from the 'Wilderness Montage DDMN006' and ink around the edges with Archival Sepia ink. Adhere to left side of card as shown. 4. Cut the Styled Label from grungeboard. Stamp quote from 'Vintage Automobiles DDRS033' stamp set onto the label using Archival Sepia ink pad. Sponge the edges of the grungeboard lightly with Sepia ink using an ink blending tool. 5. Pierce a hole at the left and right sides of the label using an awl and insert two decorative brads. 6. Adhere grungeboard to the card using foam adhesive to complete! Hope you've enjoyed these cards and ideas! Now it's over to you... I'd love to hear your feedback on what Sizzix dies you love! Please let me know in the comments! I'll look forward to sharing more ideas with you soon. Hi stampers! 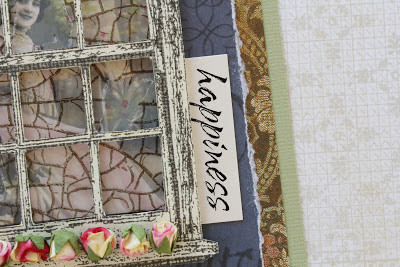 Today we are sharing projects using the Gazette Background Stamp! Details: I cut out this two envelopes by using the Sizzix/Tim Holtz die Movers&Shapers ,Pocket Envelope'. I stamped the Gazette stamp with Memories ink Soft Brown and the bridges with Memories ink Black. I sponged the circles with Memories ink Cup-a-Joe. 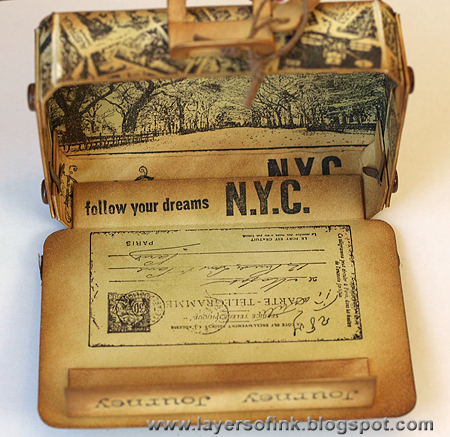 Bridges stamps: DDRS093 New York Vol. 1 and DDRS052 Notre Dame. Details: He's dashing, isn't he!!! I've been having a lovely time playing with Darkroom Door's Gazette background stamp. I created the background to this piece by stamping 'Gazette' with VersaFine Smoky Grey ink onto white paper and then once again stamping it onto another piece of paper, without re-inking the stamp, to get a more faded effect. After that, it was just a matter of cutting the papers up to create this composition. Other Darkroom Door products used to complete this project are: Dashing Gents, Champs Elysee, Steampunk stamp set, Regal frame and Love Letters montage. I cut little rectangles to fit on the top of the tie to give an extra layer for the knot in the tie. I then cut a background panel from white cardstock. I stamped all of the pieces using the Gazette stamp and Black Archival Ink. I sponged each of the ties using a different color (blue, green, and orange) dye inks. 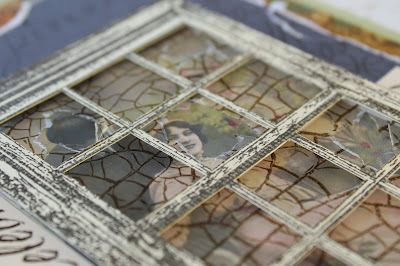 I distressed the edges with a distressing tool and then sponged the edges with brown dye ink. I attached the knots to my ties. After that I added a few metal charms with twine to the tie and used the Alpha Strips to create my Happy Fathers Day Sentiment. I wanted the words to look like tie pins so I mounted them on black to make them pop out. After I assembled the card I started thinking about how I wanted to try creating a card for each tie to give it more of a focal point. I pulled the three ties off the card and made three separate cards. I remembered I had several cigar bands in my stash which would make a perfect tie pin. I pulled them out and found a lovely red and gold band. I cut it to fit the center of my tie. I then designed the card around those colors. I mounted the tie onto a white background distressed with a hint of brown. I layered that onto a red cardbase. I added a few strips of red cardstock at the top and bottom. I added touches of gold all the way around the edges with a gold Krylon pen. 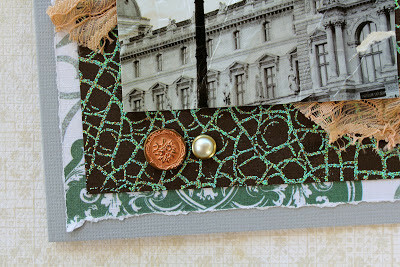 I added a couple of vintage buttons with a gem inserted in the middle. I finished it off with a Dear Santa - Wordstrips which says celebrate. I think this looks a little like a champagne bottle. Following the idea of a tie I decided to make a background that looked like a white shirt. I created a white cardbase and scored a few lines on either side of a white mounted background. I distressed everything with a touch of brown ink. I cut the corners to follow the lines of the tie. I added a new tie pin from metallic cardstock with the same charm moved up onto the tie pin. My final card used the most pieces from the original card but changed the cardbase and design. I hope this gets your ideas flowing! I love the way the gazette background provides wonderful textures and depths to the focal image and the background. Hi everyone! 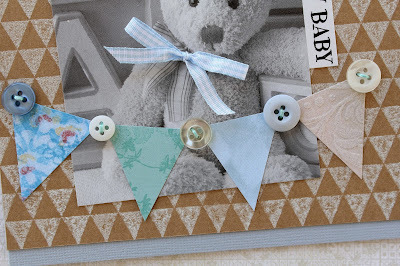 Today we are sharing project ideas using the Triangles Background Stamp! 1. 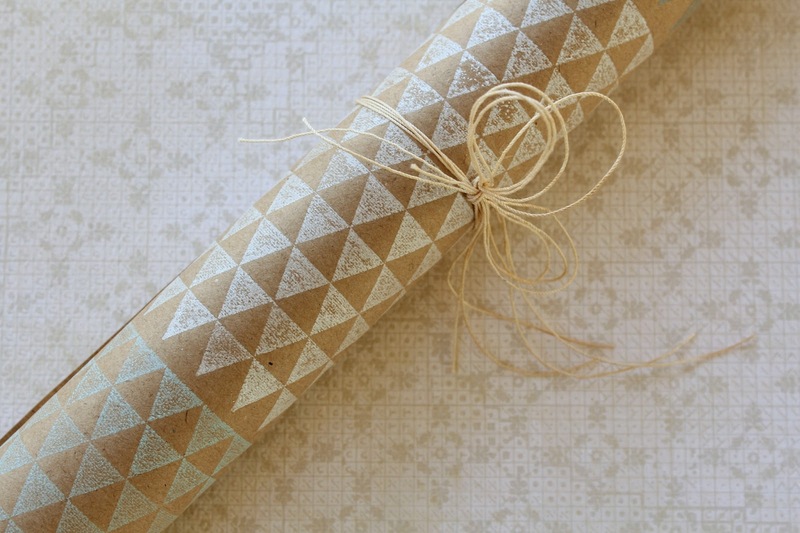 Stamp a large sheet of brown paper with the triangles background stamp. 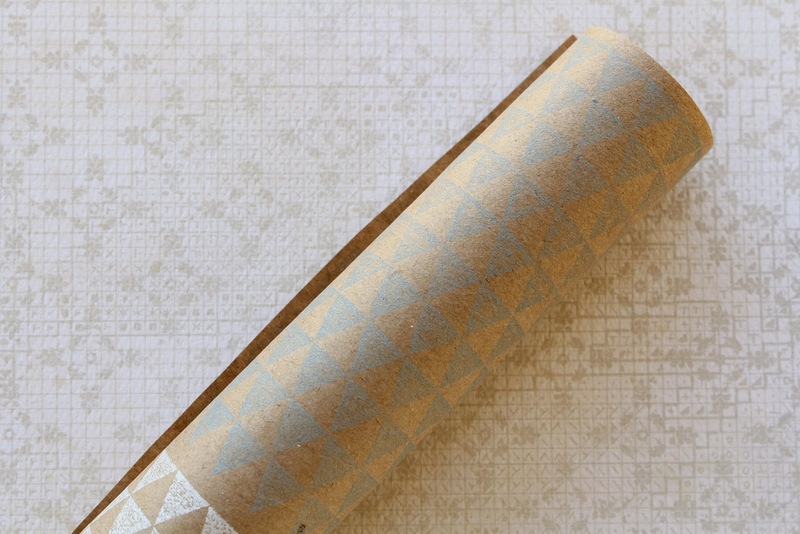 Use three shades of ink and stamp in a block pattern. Repeat until the paper is covered. Roll and tie with string. 1. Stamp kraft card with the triangles background stamp using white ink. 2. 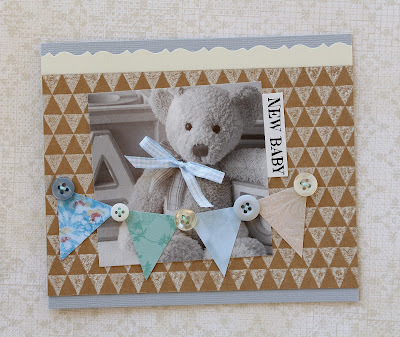 Attach a Hello Baby photochip to the stamped card and embellish it with a ribbon bow. 3. Cut triangles from scraps of patterned paper and adhere them across the photochip. 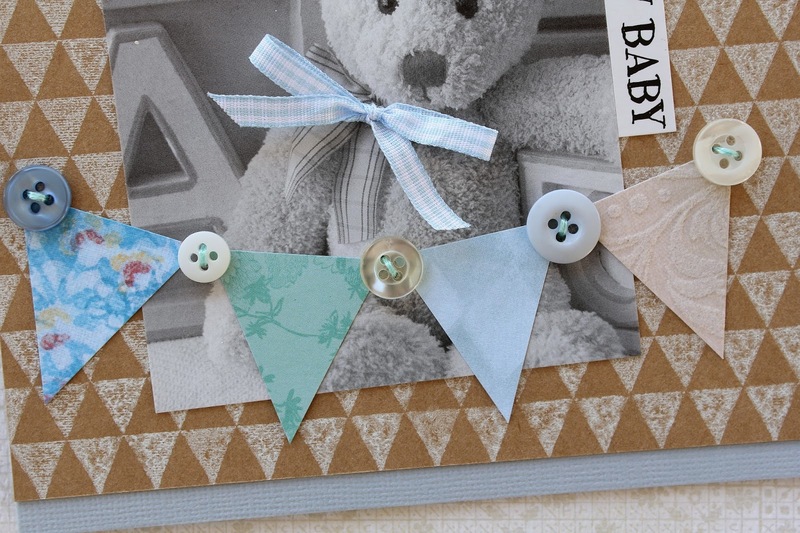 Stitch buttons to the bunting for added interest. 4. Cut along one edge of cream card with decorative scissors. Affix behind the kraft card and attach the whole thing to a blue base. 5. Finish with a Hello Baby wordstrip. I also used the Everyday Life Collection and the Big Numbers Collection. I love how these stamps look fabulous with each other. So easy to mix it up. I used Gel Medium through a large triangle stencil as a base and then stamped the smaller triangles on top of it. I used Ranger's Distress Markers to color in some of the triangles and all of the letters. Details: One of my favorite techniques to use on background stamps is embossing. 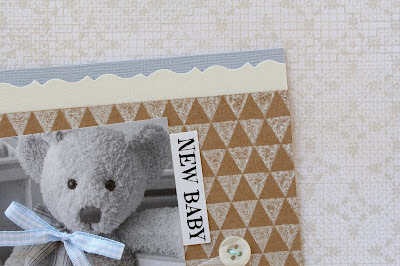 Sometimes background stamps can get lost on the card, but by embossing your background images, it helps these wonderful stamps come to life and can create a focal point such as on my card today using the new Triangles Background Stamp. I first stamped my background using Versamark Watermark ink and then embossed the background image using three different colors, silver, Zing Leaf, and Zing Blush. I love the glossy texture it adds. I then cut the flowers from a Viva La Flora Photochip and adhered them to the card front followed by my sentiment cut from the Bright Blossoms Wordstrip. A quick and easy card to put together for someone special. Thanks for visiting! We all hope you enjoyed our ideas today! Hi there stampers! We have a bumper blog post for you today! 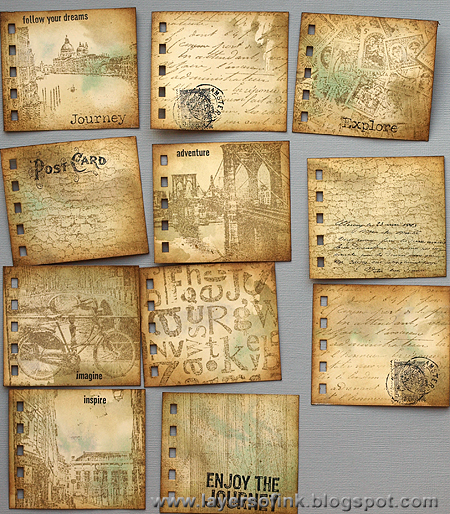 The Creative Team have been very busy with the new Background Stamps and have lots of great projects to share with you! 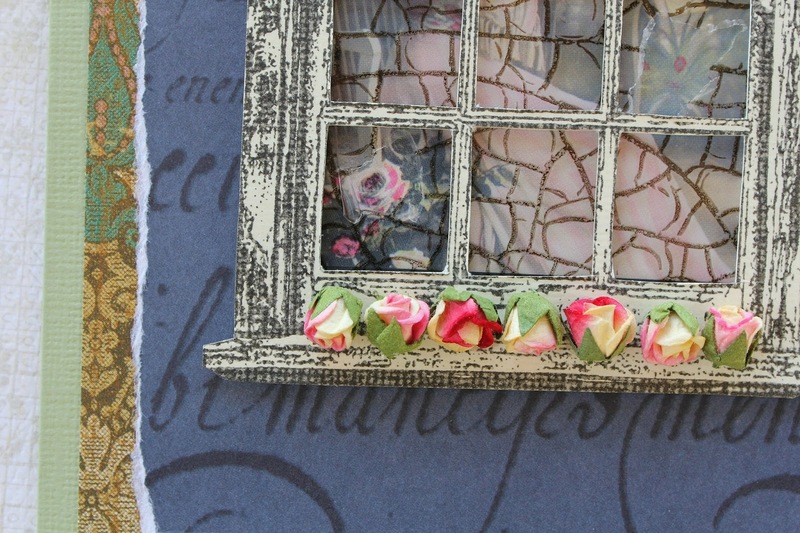 Today we are showing projects using the new Postage Stamps Background Stamp! I had lots of fun making some cards by using this wonderful (big!) Darkroom Door DDBS030 Postage Stamps stamp! The 1st and 2nd card : I stamped with Adirondack Big & Juicy ink pads, blended the colours with a water brush and I stamped the images with StazOn ink Jet Black. Onto the Notre Dame and the Big Ben I used a little bleach. 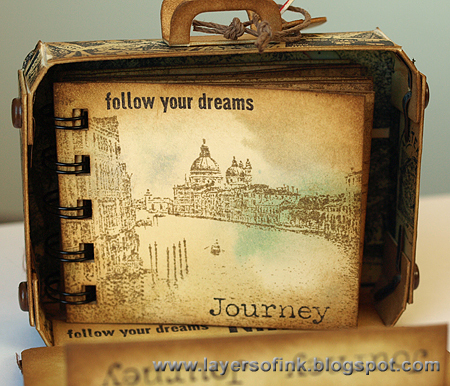 Stamp sets I used for this two cards: DDRS073 London Vol. 1, DDRS074 London Vol. 2, DDRS052 Notre Dame, DDRS049 Tour Eiffel, DDRS029 Prague Vol. 1, DDRS090 Discover. I sponged the edges with black ink and matted the cards onto black cardstock. I added an image from Filmstrip London Vol.1 and 'Destiny' from Wordstrip Prague Vol. 2. The stamp 'Find your way' is a DDRS090 Discover stamp. I love this thought that, 'Music is the outburst of the soul'. I love to sing and I especially love those moments when I really lose myself in the melody or lyrics of a song. I find myself all goose bumpy and emotional and lost in the wonder of it all. There's nothing like it! It's fun to sing with my beloved too and it's such an amazing way to connect with someone. I've been having a lovely 'dress-making' time as I played around with the new Darkroom Door background stamp, Postage Stamps. I've simply stamped the background onto some white paper with pink ink, scrunched it up a bit and created the shape of a skirt. I scalloped the bottom edge of the skirt with scissors and added a little layer of lace underneath the skirt. Then I hand cut a torso shape to go with it, adding a swipe of ink around the edges of the skirt and bodice. I've also used words and images from two of Darkroom Door's stamp sets to create the background : 'Chorus' and 'Champs Elysée'. Finally, I added some additional music inspired bits n bobs and a bit of lace complete the collage. Now it's time to turn up the music and have a little sing-a-long! It's good for the soul! 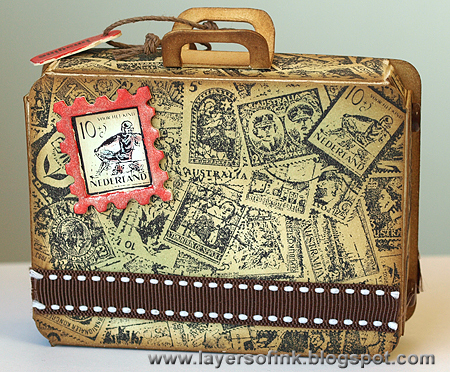 When I saw the new DarkRoom Door Postage Background Stamp I thought of the Sizzix Suitcase die. I started with cutting out two sets of the dies. I stamped the postage stamp using a water resistant black ink onto the background. I added touches of color to the postage stamp using watercolor pencils and a waterbrush. I sponged the other pieces with black dye ink to get the edges and pieces to pop against the colorful background. I added a few brass accents to the front. I then decided to turn this into a gift bag. I didn't want to create the bag myself and had an "AHA" moment where I ran into the kitchen and pulled out a brown paper lunch bag. The bag was a bit too long for my purposes so I trimmed it off to fit behind the suitcase without it showing. The only other trick was to make it lay flat when it wasn't open. To do that I had to fold the bottom of the bag in half to put another crease in it so it would lay flat. To finish off my bag I decided to take some beautiful tissue paper I up-cycled with adding travel related words using the Journey Wordblock Stamp. I used black water resistant ink on the tissue paper. Any good traveller has charms and mementos picked up along the way. I created a few Faux Metal charms to dangle on my suitcase. I started with applying versamark to white cardstock. I used a gold embossing powder. I heated it up and repeated until I had a nice thick coat of embossing powder. I applied Versamark ink to the the Postage mark from the New York Volume II set and heated up the embossed paper until it was liquid and set the stamp in the embossed surface. Let this cool off for a minute and the stamp will pop right out. I then cut out the shape. I also took my Journey Wordblock and did the same thing and cut out one of the words to make a longer shaped charm. I found the word Explore on the Venetian Wordstrip which was mounted on black cardstock and added to the charm collection. Now I have a great gift bag to give someone who is going off on a Journey. My gift bag can be used for a graduation, retirement or any other journey in life. This is a really useful background stamp which can be used on a large variety of projects: cards, layouts, 3-D projects etc. 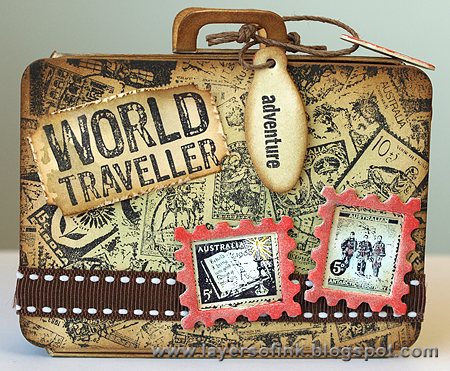 My first thought when I saw it was of old suitcases covered with stamps or travel destinations stickers. 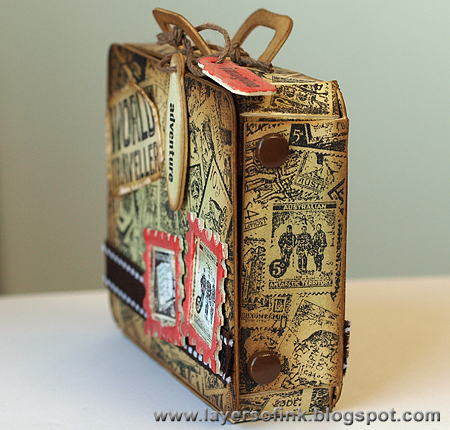 I made a suitcase with a mini-book inside. 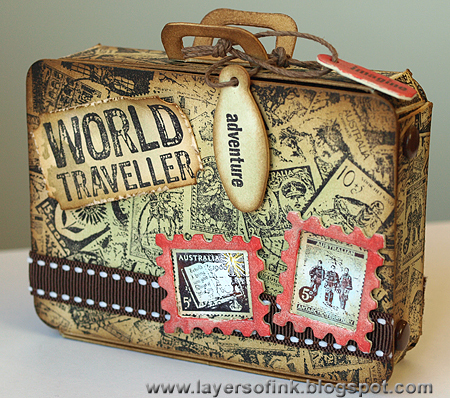 The suitcase was die cut from cream mat board and stamped with the Postage Stamps background stamp, using Archival Jet Black ink. I inked it with Old Paper and Gathered Twigs. A suitcase needs a ticket and some luggage tags. The ticket was stamped with one of the sentiments from the Nomad set, and the two small tags were inked and stamped with sentiments from New York Vol. 1. Background stamps don't only need to be used for backgrounds, I stamped the Postage Stamps again, on Ranger's Specialty Stamping paper and coloured three of the stamps lightly with Distress Inks. They were cut out and placed underneath a die cut postage stamp frame. The postage stamp frames were inked first with Brushed Pewter Distress Stain, but I wanted more colour and went over them again with Barn Door Distress Stain, giving them a nice red metallic look. I kept the back of the suitcase simple because I didn't want to cover up the background, and used only one framed postage stamp. Here you can see the suitcase from the side. 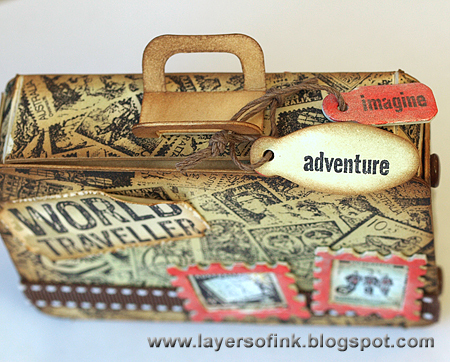 If you want to see a tutorial for another version of the suitcase, I made one here. The two small tags were tied to the handle. 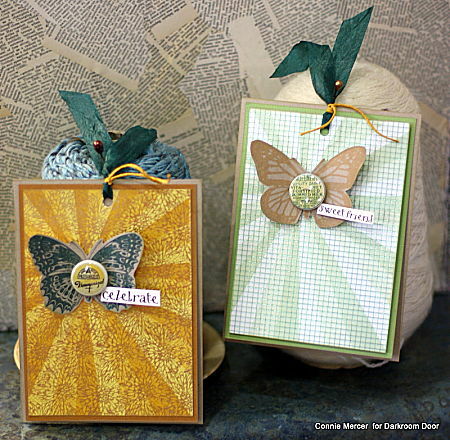 I love these types of small sentiment stamps, they are very useful. 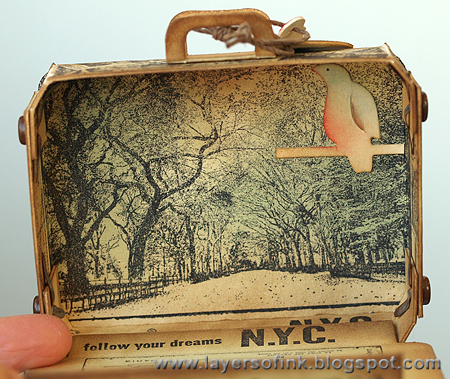 On the inside, I stamped the gorgeous Central Park photo stamp with Archival Jet Black and inked with Old Paper, Bundled Sage and Gathered Twigs. I love how it looks like you are looking really far into the suitcase because of the perspective in this stamp. A little left-over bird on my desk flew into the suitcase too. On the front flap, I stamped a stamp from the Love Letters Vol. 2 set and some more sentiment stamps from New York Vol. 1. As you can see 'N.Y.C' is stamped twice, I forgot that the lower part of the suitcase would be covered up by the flap. Inside the suitcase there is a small mini-book, which can be filled with travel memories and photos, or perhaps with quotes. The pages are made from manila cardstock which was coloured with Bundled Sage, Antique Linen, Frayed Burlap and Brushed Pewter Distress Stain. 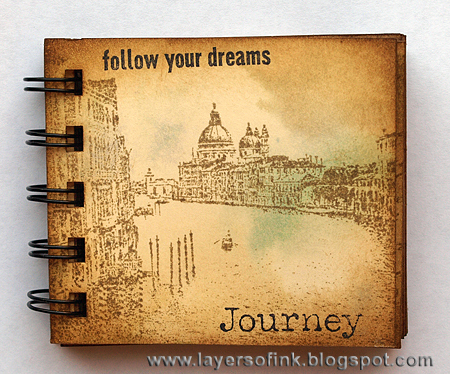 When dry, I cut them into pages (7x8 cm) and stamped them with different background and photo stamps using Frayed Burlap ink. 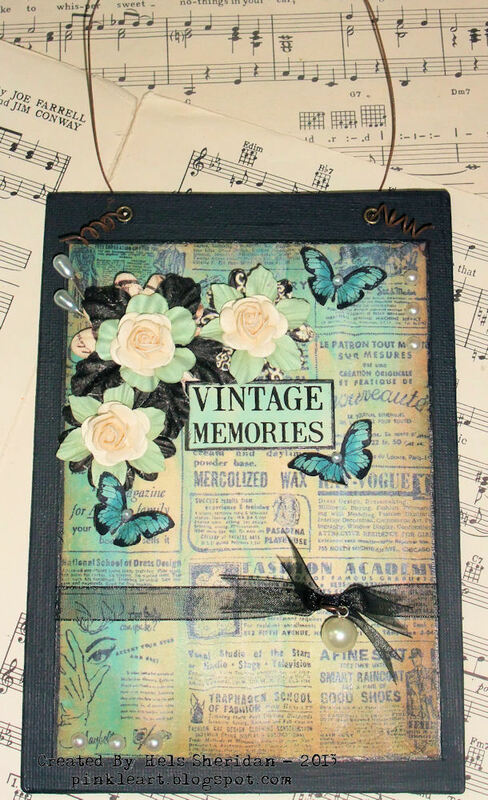 I also added some sentiments and more stamping with black ink. The back of each page was left blank, to give more space for writing or photos. All the edges were inked with Gathered Twigs. I bound it with my Bind-it-All. This first stamp comes from Venetian Vol. 1. Here's one of the inside pages, with a stamp from New York Vol. 1. 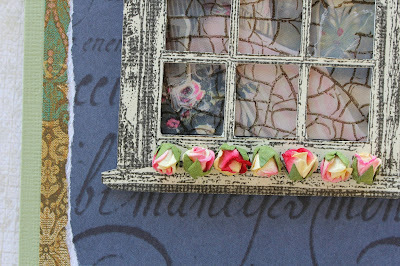 Hope that's inspired you with a few new ideas on how to use the Postage Stamps Background Stamp! For this accordion fold domino book, I stamped the fronts and sides of two dominos by inking the Darkroom Door stamp DDCS006 Music, and pressing the domino onto the stamp. I used StazOn ink Jet Black, Timber brown and Royal purple. I cut a strip of white cardstock and scored and folded it, a little smaller than the domino. I stamped the Music stamp and the Photo stamp DDSB004 Laneway , I masked some areas and I used not the entire stamp, just some pieces. I sponged the front- and backside of the paper with Adirondack Purple Twilight, Sunshine yellow and Distress ink Picked Raspberry. I cut the words , Just for you' off of the Wordstrip DDWS002 Full Bloom , sponged the words and glued them onto the page. I glued a piece of ribbon on the backside of each domino and added the accordion book on the domino-backsides.